I think it's safe to say summer is fully here! I'm all about glowing skin but I struggle in the summer because I don't want heavy, greasy products. 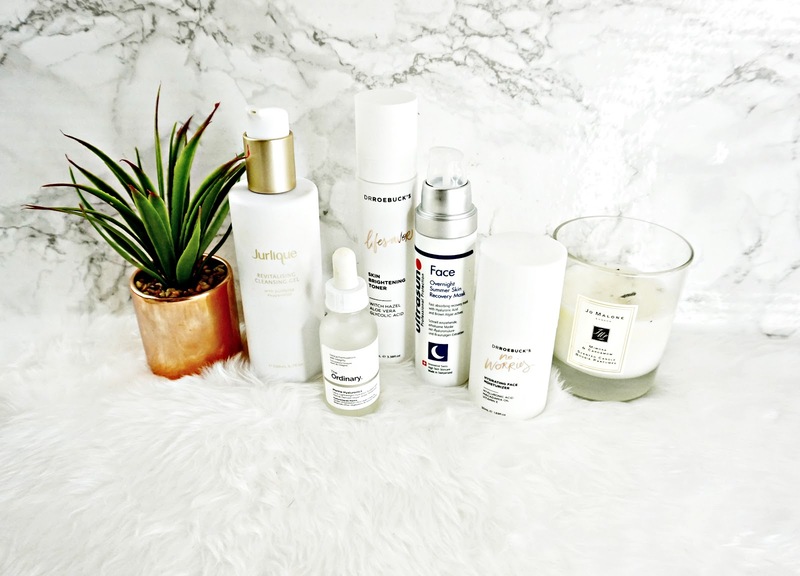 So this post is my favourite summer skincare products to achieve a glow without feeling smothered. I'm loving this cleanser at the moment. It's a really fuss free cleanser that does the job. It has light gel consistency that slightly lathers when mixed with water. It doesn't irritate my eyes and it hasn't caused me to breakout. It leaves my skin feeling so clean and fresh but not dry or stripped. I've been loving this after a long day in the sun. Brightening toners are the best way of getting a glow without the greasy feeling of creams. I've been loving this one from Dr Roebucks. It's so refreshing and has really helped give my skin get a radiant glow. It contains a range of soothing and hydrating ingredients as well as Peppermint Oil which is a natural AHA. This comes in a spray form, so I just spritz it after cleansing and leave it on. It's a great brightening product that's all natural to. I've spoken about this loads recently recently but this is such a great serum. It's a super hydrating, fuss free serum. It really helps to keep my skin hydrated and plump without leaving it heavy or greasy - it absorbs pretty much instantly. This has been my go to day moisturiser. It's so light but so hydrating. I have dehydrated skin and I really struggle in the summer to find moisturisers that are hydrating enough but light enough so I'm really happy to have found this! Plus this does give my a skin a healthy glow. An evening routine serum that gives my skin an amazing summer glow is this one from Autography. It's a really light-weight yet hydrating serum that contains a hint of self tan. It gradually builds up and maintains a sun-kissed glow. It develops into a really natural, even looking tan. This doesn't break me out either. I've become obsessed with this treatment. It's an overnight mask that helps prevent and tackle the effects of the sun, whilst being super hydrating. This has all the benefits of an overnight mask but without the heavy consistency. It's a super light weight lotion that absorbs pretty much instantly. In the morning though my skin is soft, plump and glowing! I really can't recommend this enough.